About Mary Redman Emerson Fine Art Artist bio. Mary grew up in Oklahoma, and now lives in Texas. She always loved art, but it was not until her children were grown, and she had finished her Ph.D. that she was finally able to do what she always wanted to do--study drawing and watercolor painting. Mary says she paints the "colors of life" in her wide variety of watercolor subjects - bright florals, cowboy hats, chickens-- subjects that she "just has to paint!" 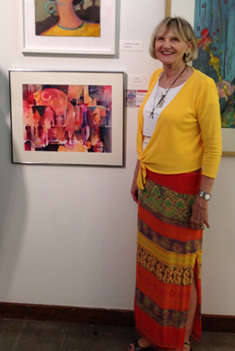 Mary has studied watercolors with regional and nationally known artists-- including Zoltan Szabo, Ken Hosmer, Tom Lynch, Naomi Brotherton, Carol Maddox at LaRomita in Terni, Italy, and Judy Morris in France. Doctor of Philosophy, Higher Education, Administration. University of North Texas, Denton, Texas. Master of Education, Vocational-Technical Education, University of North Texas, Denton, Texas. Bachelor of Arts in Education, English. East Central State University, Ada, Oklahoma. 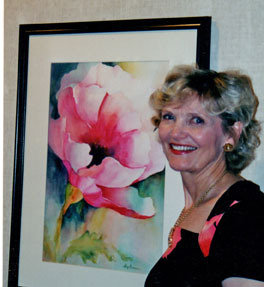 Mary is a Signature Member of Southwest Watercolor Association, member of Oak Point Art Society, Visual Art Society of Texas, and the Southwest Watercolor Society. Mary's paintings have won awards in juried shows in Oklahoma and Texas, and her paintings are in international private, and corporate collections, and has presented several Solo Invitational Exhibitions. She is the founder of the Oak Point Art Society and is listed in the World Artist Directory of Accomplished Artists World Wide. She is represented by the Oxide Gallery, in Denton, Texas.See Art Highlights for specific images. 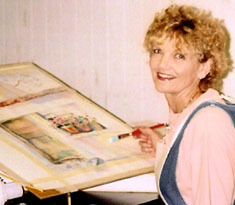 Mary has taught watermedia classes in Oak Point, Texas, since 2008. She was a Professor at Collin College, Frisco, Texas, in the Computer Science Department for twenty years. Mary's studio, Happy Trails Studio, is open by appointment.